University of Adelaide researchers have found the answer to one of natural history's most intriguing puzzles – the origins of the now extinct Falkland Islands wolf and how it came to be the only land-based mammal on the isolated islands – 460km from the nearest land, Argentina. Previous theories have suggested the wolf somehow rafted on ice or vegetation, crossed via a now-submerged land bridge or was even semi-domesticated and transported by early South American humans. The 320-year-old mystery was first recorded by early British explorers in 1690 and raised again by Charles Darwin following his encounter with the famously tame species on his Beagle voyage in 1834. Researchers from the University's Australian Centre for Ancient DNA (ACAD) extracted tiny pieces of tissue from the skull of a specimen collected personally by Darwin. They also used samples from a previously unknown specimen, which was recently re-discovered as a stuffed exhibit in the attic of Otago Museum in New Zealand. The findings were published in Nature Communications today and concluded that, unlike earlier theories, the Falkland Islands wolf (Dusicyon australis) only became isolated about 16,000 years ago around the peak of the last glacial period. "Previous studies used ancient DNA from museum specimens to suggest that the Falkland Islands wolf diverged genetically from its closest living relative, the South American maned wolf (Chrysocyon brachyurus) around seven million years ago. As a result, they estimated that the wolf colonised the islands about 330,000 years ago by unknown means," says Associate Professor Jeremy Austin, Deputy Director of ACAD and co-lead author with Dr Julien Soubrier. "Critically, however, these early studies hadn't included an extinct relative from the mainland, the fox-like Dusicyon avus. We extracted ancient DNA from six specimens of D. avus collected across Argentina and Chile, and made comparisons with a wide group of extinct and living species in the same family." 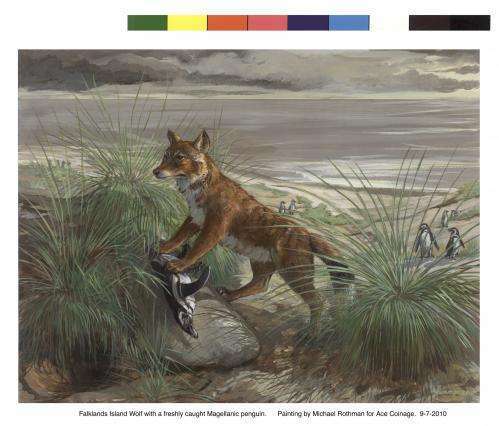 ACAD's analyses showed that D. avus was the closest relative of the Falkland Islands wolf and they separated only 16,000 years ago – but the question of how the island colonisation came about remained. The absence of other mammals argued against any land bridge connection to the mainland. "The Eureka moment was finding evidence of submarine terraces off the coast of Argentina," says study leader Professor Alan Cooper. "They recorded the dramatically lowered sea levels during the Last Glacial Maximum (around 25-18,000 years ago)." "At that time, there was a shallow and narrow (around 20km) strait between the islands and the mainland, allowing the Falkland Islands wolf to cross when the sea was frozen over, probably while pursuing marine prey like seals or penguins. Other small mammals like rats weren't able to cross the ice." Raft or bridge: How did iguanas reach tiny Pacific islands?